performance-maker Katerina Kokkinos-Kennedy about three live art events she has created in 2009. Suzanne – Hi Katerina, can you tell me a bit about your relationship with live art, and some of the work you’ve made this year? Katerina – I’ve been intrigued by live art for a long time but didn’t consider myself a ‘live artist’ until recently. Having said that, I’ve always considered the meeting with the audience as the central ‘event’ of my work. I also value ‘unfinished’ or provisional work for its permeability – like a garment with its seams showing, a kind of rough draft that seems to hold the possibility of an unpredictable encounter rather than being a closed system. I think that’s probably the essence of live art for me. At the VCA I made a number of small works that played with this indeterminate zone between theatre (as we normally understand it) and encounter – in which the structure of the piece and the performers allowed themselves, their tasks, to be interrupted and influenced by what happened with the audience. So some of these interests are 15 years old. 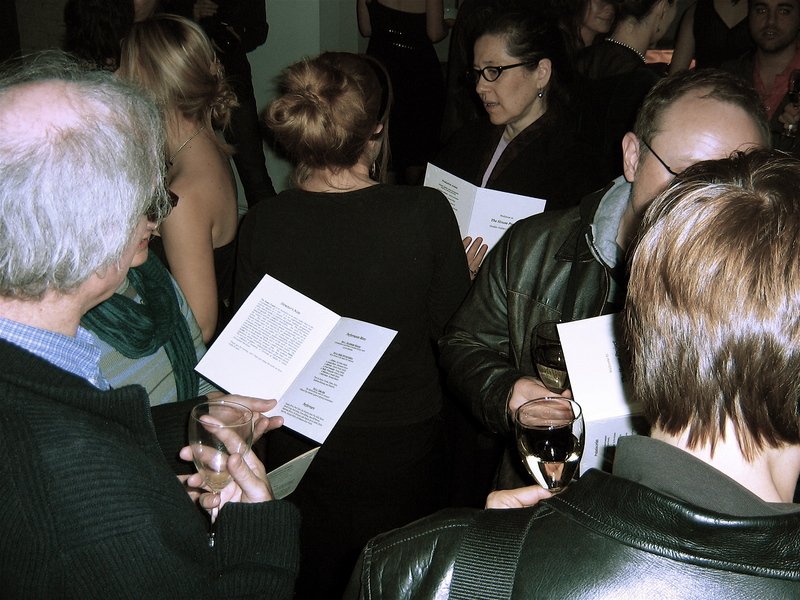 But the big shift occurred recently – in 2006 when I collaborated with you and bettybooke to create an audience-interactive work that embraced a fictive text, improvisation, and performer/audience conversations within a series of encounter-options. This represented a conscious break from the text-based work I was trained in. I’m also fascinated by the dramaturgical challenges posed by live art. How to design an event in order to cue the audience into the ‘game’ and the possible options that a moment, their choices or their interventions might allow for. This ‘second-guessing’ on behalf of the audience is a bit like locking yourself inside a cupboard and trying to work your way out from the inside – it’s crazier than directing a play that’s for sure. So the problem-solving aspect of live art can seem even more intense than directing (if that’s possible) because the constant to and fro of making the event and slipping into the event as a pseudo-participant are so vital to the development and success of the work in terms of designing the audience’s journey. This year I’ve been involved in making three works; 1. My Masters work, The House Project – which was a re-mix of Ibsen’s Hedda Gabler using live art, solo performance and feminist perspectives as key strategies; 2. As a dramaturg & performance consultant on Tamara Searle’s project in the absence of sunlight for Melbourne Fringe 09, a solo performer and solo spectator piece, and; 3. Once, a prototype live art work that I’m developing for Punctum’s live art In Habit residency at the Abbotsford Convent in February 2010. Suzanne – OK, can you say a little about each one? Suzanne – Where did the idea originally come from? Katerina – It evolved out of my research and out of my interest in combining live art practice with a textual influence & that doesn’t occur a lot. But it came from my desire to minimise the distance audiences can feel in relation to a canonic text/character such as Hedda Gabler by transforming the play into an event. I was struck by Tim Etchells’ comment that for him ‘the text is the event’ or something like that. One of the things that interests and inspires me is this idea that we’re changing; that human beings are changing their composition. Again, I don’t want to generalise, but I do think that we want, even crave engagement. Sometimes I wonder if this could be a response to, or a rebellion against, the loss of time/intimacy/engagement in aspects of our lives. It may well be a reaction to the moves we’ve made towards/into technology/anonymity and to the specific forms of isolation that can generate. I actually vividly recall a world without the net! And that amazes me. Can you remember life without it? That’s weird because it’s so very recent; something that entered the mainstream culture about 10 years ago is now almost impossible to imagine living without. So the short answer is – although I love words, poetry and form – I think I love relationships more. My passion for interaction and dialogue is related to my shift towards live art. Suzanne – What responses have you had to the work you’ve made? Katerina – Many and various, ranging anywhere from audiences being excited, moved, confronted, offended or bored. Suzanne – What do you attribute these responses to? Katerina – A few things: For one, I think that some people come to a performance event essentially open to that event, i.e. not hankering after something else or wanting something to conform to a set of predetermined rules, aesthetics, etc. I had assumed, especially in a live art context that that would mostly be the case. Of course it isn’t the case and so there have been many responses. This is one of the reasons I have been really excited about the lala blog – it’s so valuable to have a forum where people can find out about live art events, have a chance to discuss works, to respond to posts, do interviews etc. I’m a bit over the notion of The Critic, partly because we have so few informed and intelligent performance critics. I’d love to institute a code of ethics whereby if you haven’t made a performance you can’t write about one. That’s an Ariane Mnoushkine quote and I love it. It seems particularly important for an art form like live art to encourage and foster conditions for good writing; thoughtful, informed and engaged writing. The opposite of ‘how clever am I’ writing; the sort of critique that is curious, rigorous and perspicacious. With in the absence of sunlight, what were the challenges of creating and performing a work for just one viewer? I mean is that even an audience? I’m not sure I’m happy you asked that. The short answer is billions of tiny issues arising constantly and still arising. In 2008 Tamara Searle generated the concept, text and first version of the work using a short story by Marjorie Barnard. We had a Punctum seedpod in June this year and I was there as a dramaturg and for performance feedback. For a small work I have to say it was a total time pig. I’m sure our friends were heartily sick of hearing about the endless tweaking of this miniature work. But in having a constant flow of conversation; ‘yes, but’ and ‘do you think?’ and ‘maybe we could…’ Tamara, Xan Colman and I were able to keep refining what was a difficult and challenging performance experiment. It took up an inordinate amount of time in terms of the second-guessing I mentioned before – of constantly putting ourselves in the place of the participant, of working those issues over and over again. But at the same time it was fascinating and engrossing. I realised at one point that we weren’t setting out to make a work for ‘people like us’ (because let’s face it we’re pretty weird) but rather the person who enjoys going to see something different. I think a lot of performance-makers (myself included) can be a total pain in the a*** to make work for, but your curious punter off-the-street (whoever that may be) can get real pleasure from something that we might otherwise criticise into oblivion. That always gives me pause. Suzanne – What inspires you to make this kind of ephemeral, interactive work? Katerina – I love people and I love audiences; it’s a very daggy thing to say but it’s true. I’m in awe of people’s capacity to remain open to the beauty and strangeness of life. That’s the kind of person I make my work for, that’s my ‘target audience’ – I loathe that term but I’m happy to use it to say that. When I make a work I’m often struck by the resistance of some participants but I must say – my faith in human nature is always restored by those who are open to engaging with what they don’t understand, don’t like or don’t even feel comfortable with. I think some people have the capacity to dream along with you, whilst others will fight you to the very end. Is audience-interactivity and permeability of form, likely to remain your focus in terms of future projects? Absolutely. At this very moment I can say that I’m very bored by notions of acting; that could change of course. I’m capricious. And I’ll admit that Shakespeare could always tempt me – somewhere in the back lot of ‘my ideas for projects’ there’s this plan hatching to do the Bard alla Forced Entertainment. I mean how perverse and gorgeous and awful could that be? But in the meantime I plan on making events for and with people. Events that might help to remind us of what’s important – of what we might miss if we get too caught up with unrealities. Suzanne – Thanks for talking to lala. ← Quarterbred – live art overlords? Or just nice guys? You decide.